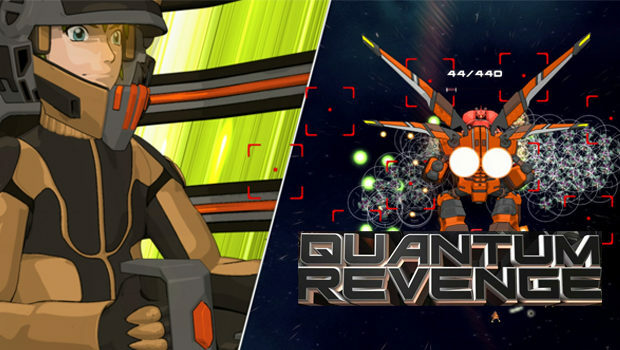 Good news to all the iPhone users who love twin-stick shooter games as ‘Realtech VR’ has made way for you to its brand new shooting game called ‘Quantum Revenge’. Here are the reasons why I believe this game is far better than other twin-stick shooter games in the iOS app market. Inspired on Japanese manga game which is a combination of 2D & 3D animation and gameplay, Quantum Revenge is all set to make the gamers indulge in its breathtaking story line and visual concepts. The game is set in a war raged space in the galaxy where you are to destroy waves of enemies using advanced mech warriors with their dual shooters. The story is about furious aliens trying to destroy earth and other planets to ultimately sweep the entire solar system. Your goal is to stop them from doing it by shooting those aliens that come in waves and get more powerful, wave after wave. The game features include both 2D & 3D animations with great story line and awe inspiring graphics. It has five missions with two enemy bosses where the ultimatum is to destroy the main boss. Your mech is capable of upgrading to different type of armors, abilities, weapons and special attacks that makes the game more interesting. So you can get more powerful with these upgrades and destroy the enemy waves more quickly and effectively. There are various challenges that are thrown by enemy bosses that makes your mission tough and challenging. Every mission has different kind of impressive graphics and setup that makes you more curious to see what next level has got to offer you. Every battle in this game gets more hectic but the special upgrades really makes you feel more powerful and confident. But do not get over confident as the enemy boss is smart too as he learns your every move and tries to make it impossible for you to defeat him. You have advantage of unleashing different type of weapons to try and destroy your enemy and it gets interesting with every upgrade. The story line is really very engaging and makes you feel that you are in that story and really fighting a war against the bad aliens. There are several emotional twists that you will see in the animated story too. So this game doubles your entertainment and gives a hang of playing the game as well as watching a movie with a great war story. This game can not just be enjoyed on your iPhone and iPad but is designed to support apple TV as well. Quantum Revenge has dual touch control configuration and a game controller support. The latest in 2D technology with bone deformation and particles is used in making 2D animation in this game. There is possibility of being able to connect to iOS game center so you can compete with other users where you will be able track your ranking. With different kind of visual appeals and environment, the game really stands out to be very unique and realistic among other leading iOS game apps.